Talking of 90s revival, I realised that the clothes I was wearing yesterday were something I could easily have been wearing 20 years ago. This isn’t the actual shirt I had as a teenager (that one, like all of them, inexplicably had a German flag on the arm), but it’s pretty much the same. I got this one from an army surplus store at some point in my 20s for £4, but by mistake they gave me two, so it essentially cost me £2. I recently saw some identical shirts in Topshop for about £40. Sometimes it pays to be a loser who never throws anything away. Until about five years ago I actually did have a top I’d been wearing since the early 90s. It was a burgundy and black ribbed thing that seemed to be made of near-indestructible material. A lot of bloggers make slightly shady money by taking photos of themselves in clothes that are currently in stores (often sent as a free sample by the manufacturer), and then using a special tracking link that gives them commission for every click and purchase. Distasteful hyper-capitalist ethics of turning your life into a walking advert aside, I would be hopeless at that. Most of my stuff is second hand or home-made, and I hang on to clothes I like forever if they still fit and are in good condition (I’m pretty ruthless at giving unworn things to charity shops though). A couple of times a year I go on a big (unpleasant and stressful) shopping trip and stock up on basic things like jeans from chain stores (ok mostly Muji or Topshop to be honest), and that’s kind of it. Probably by the time I’d notice a trend it would be on its way out. Talking of army surplus clothing in my youth, when I was a teenager I also had one of those army jumpers with the fabric covered shoulders. Almost everyone else I knew did as well. Oh yeah, I also had one of those canvas army bags that I used as a school bag. That was also the thing. Why did I even bother going to other shops? (Not that there is much selection in my hometown, it’s a decrepit shipbuilding town that went into a massive decline in the 80s). They clearly had everything I needed in the local army surplus shop. I was a small kid in all respects except height, and I also had a long-sleeved Nirvana tshirt that was like a comforting tent that was one of my favourite things. They also had those in Topshop recently. Mine came from a local hippy shop, and came with a free long-lasting scent of joss sticks- Topshop don’t provide that service. I had some very similar school shoes to these in the 90s, except in black rather than burgundy. My feet stopped growing when I was 12, so I wore the same pair until I’d almost finished school, and was also happy to wear them outside school, which is not something you can say about most shoes accepted by British schools. Yesterday was the first day in months I’d worn tights, and it felt really weird. 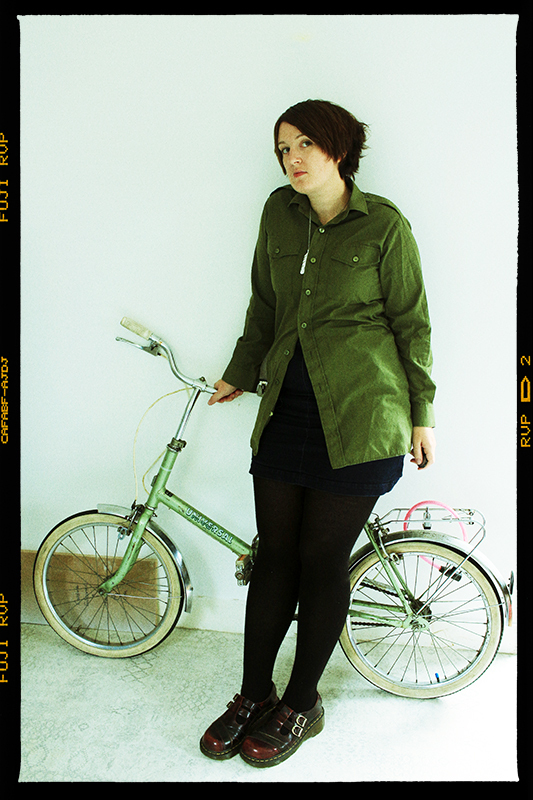 The easiest place to take a photo was in the hallway where my bike was. I’m proud of my crappy £40 bike. There’s very little to go wrong on it and it annoys serious cyclists. I had to use my 24mm wide angle lens instead of the 40mm portrait lens I’d prefer because I just didn’t have space to move the camera further back. I also had to sit on the bike to fit into the photo. Although I look short, I’m actually 5ft8 in my socks. Taking photos of yourself with a remote control is hard, because you have no real-time idea what the pictures look like. I don’t know how all those bloggers who constantly take self-timer photos of themselves smiling do it. At the best of times I only have a few expressions for photos, including Gormless, I Will Fight You and What’s That Smell?. I didn’t really enjoy trying to take the photos (esp with my current allergy-ridden hamster face), but I did enjoy faking up a medium format film look on Photoshop, to make it look more like a 90s magazine. Here is a closeup of the necklace. Mika the designer is a friend of a friend who lives in Sweden. 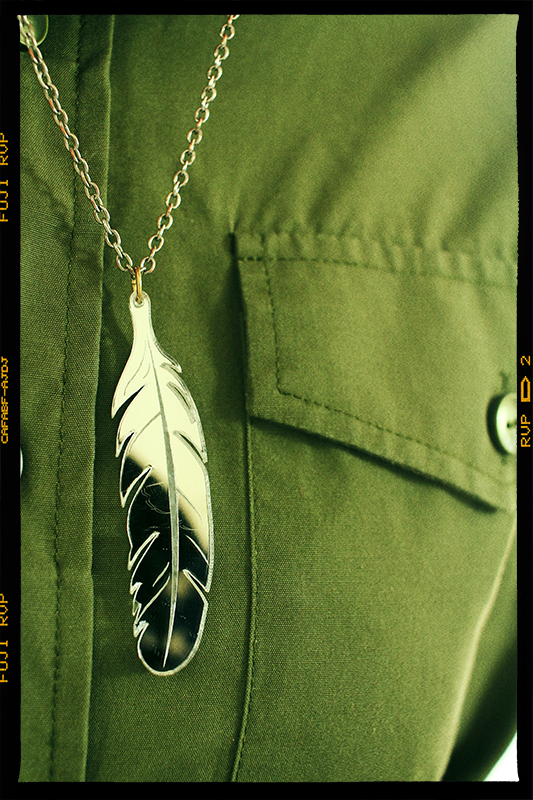 I bought two of his acrylic necklaces a while back (the other is the “I’d rather drown” pennant), and I’ve found the feather one has become a favourite that I wear more than any other item of jewellery. Here’s another Lemonheads song, for no real reason. This is basically a post I have had in my draft folder for about 3 years, even down to the Lemonheads influences, after I had a moment of realisation one day that I was wearing exactly the outfits I wore 20 years ago, just tighter (body positive feelings not being something 16 year old me was in possession of), and listening to the same music. So weird*! * The similarities between our posts, but also the whole 90s revival thing too. The whole cut of clothes was looser too then though, and it wasn’t the ideal for things to be skin tight. I’m not sure when the whole tight thing came in, I can’t really pinpoint it.